Toasts with Avocado Dip & White Bean Hummus - simply & healthy vegan recipes that taste amazing! Keep it simple or add all the delicious toppings? Thats the question here. And guess what, I wanted all of it! This is a kind of mini pizza that need prep time, but that is worth everything. If this crispy toast with delicious toppings is for yourself, your kids or your guests, you will love it, because it has everything. The sweetness, the crunch, the spiciness, salt, fresh, soft, that something extra! This is a wonderful meal that you perfectly can make for brunch, lunch or dinner. I have tried many boring vegan sandwiches in my life, and I always feel a little bit disappointed when I visit a cafe and they serve a sandiwich with no flavour or with one 2 toppings. So I decided to show the world, how easy you can make a sandwich that is healthy, but also tastes like HEAVEN! 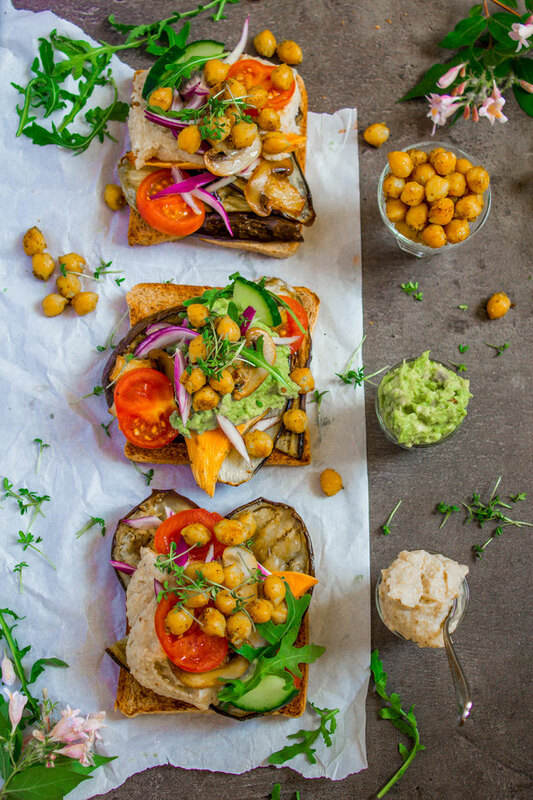 · Tips: you can also add some fresh herbs to the white bean hummus for more color and taste! 1. Slice the eggplant and sweet potato. 2. Rub the eggplant is some sea salt and set aside for 10-15 minutes, to let the eggplant sweat. 3. Wipe the eggplant dry with a clean towel. Rub them with some virgin olive oil. Be sure every spot is covered. 4. Bake the eggplant and sweet potato at 200 degree Celsius for 30-45 minutes or until they get some color. Turn them around after 20 minutes to an even color on both sides. 5. For the white bean hummus, simply add all the ingredients in a food processor or blender, and blend until very smooth, takes about 2-3 minutes depending on blender or food processor. Taste with sea salt, pepper and ground caraway seeds. 6. For the avocado dip, spoon out the avocado flesh in a bowl, add a splash of lemon juice, the pressed garlic, and mash with a fork. Taste with sea salt and pepper. 7. Roasted chickpeas: fry the chickpeas in a pan with the coconut oil, curry and pressed garlic. When it starts to pop or after 3-4 minutes, put the roasted chickpeas in a bowl and taste with sea salt and pepper. 8. Roast the sliced mushrooms in some coconut oil for some minutes, until light golden. 9. Roast or bake the toasts in a pan/in the oven until crispy and light golden. 10. 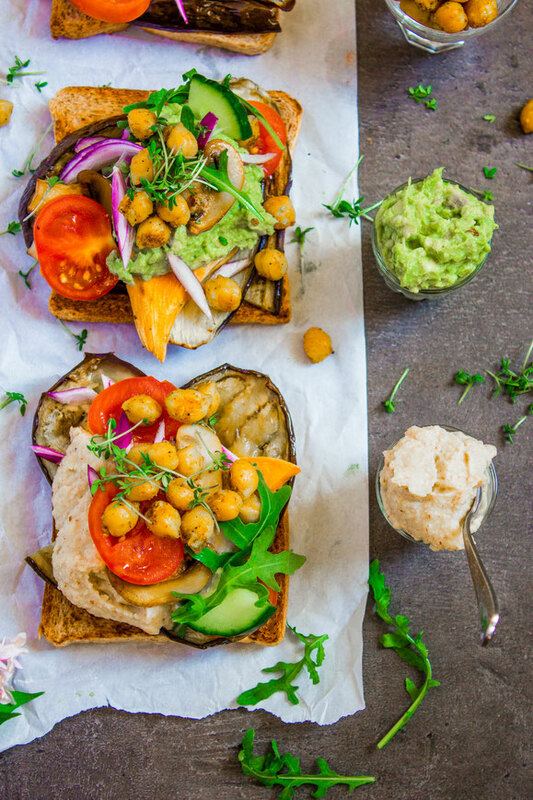 Put a slice of baked eggplant, sweet potato on the toast, then add some white bean hummus or avocado dip, chopped tomatoes, fried mushrooms, arugula, basil, cucumber. Garnish with fresh alfalfa sprouts and roasted chickpeas.